Exploring the exponential technologies that are disrupting todayâs Fortune 500 companies and enabling upstart entrepreneurs to go from âIâve got an ideaâ to âI run a billion-dollar companyâ far faster than ever before, the authors provide exceptional insight into the power of 3-D printing, artificial intelligence, robotics, networks and sensors, and synthetic biology. Drawing on insights from billionaire entrepreneurs Larry Page, Elon Musk, Richard Branson, and Jeff Bezos, the book offers the best practices that allow anyone to leverage todayâs hyper connected crowd like never before. The authors teach how to design and use incentive competitions, launch million-dollar crowdfunding campaigns to tap into tens of billions of dollars of capital, and build communitiesâarmies of exponentially enabled individuals willing and able to help todayâs entrepreneurs make their boldest dreams come true. Bold is both a manifesto and a manual. It is todayâs exponential entrepreneurâs go-to resource on the use of emerging technologies, thinking at scale, and the awesome impact of crowd-powered tools. 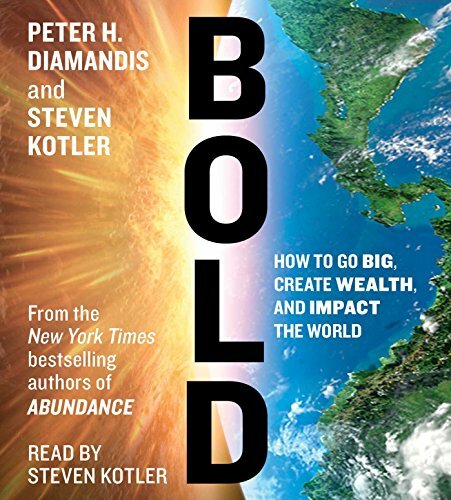 Reprint edition from Simon & Schuster (February 23, 2016); titled "Bold: How to Go Big, Achieve Success, and Impact the World"
About: “A visionary roadmap for people who believe they can change the world—and invaluable advice about bringing together the partners and technologies to help them do it. About: “Bold is a visionary roadmap for people who believe they can change the world—and offers invaluable advice about bringing together the partners and technologies to help them do it.